Humboldt Seeds spent 15 years selectively backcrossing Master Kush, transforming a classic Dutch coffee shop strain into one of the most requested flowers at Cali's best dispensaries. So let's take a closer look at her! Master Kush is a pleasure to smoke and a pure joy to grow. She's easy to clone, but even when started from seed, development is extremely fast with most seeing new leaves and measurable growth on a daily basis. However, you shouldn't let her early vigour tempt you to switch to a 12/12 flowering cycle too early; Master Kush barely stretches during flower, so you'll want to veg to full size or very close to it. 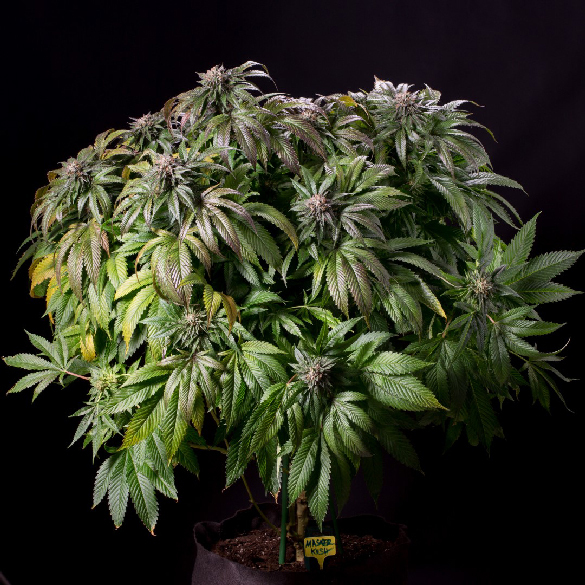 As an almost pure indica, Master Kush stays a lush, healthy green throughout her lifecycle except for some lovely specks of red, purple and orange that appear on the buds as the time to harvest draws near. I found she didn’t need much nitrogen, but she's a heavy feeder in every other way. Start off with very light nutrients like always, then increase the strength a little faster than you normally would to encourage heavier bud development. 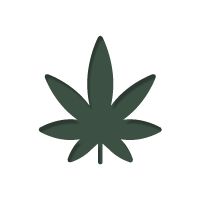 The large, crown-shaped buds will get extremely firm and resinous by the time the plants are fully developed. Master Kush's look and feel, not to mention the smell, is incredible, but the density does come at a price. If you don't have good airflow or it gets too humid, mould, powdery mildew and bud rot can set in quickly. Look under the canopy and don't be afraid to gently peel individual buds back from the stem to peak inside big, solid colas. Training plants when they're young promotes airflow and reduces your chances of having a problem with mould or rot later on. Top early to spread out the canopy and increase the number of bud sites. This will boost your yield, but it will also make the colas slightly smaller so that air can more easily reach all the way to the central stem. Selectively prune starting at week five to remove some fan leaves. This practice isn't recommended by all growers, but it will increase airflow, reduce humidity and let light penetrate deeper into the canopy for bigger buds near the bottom of the plant. Training and a controlled vegetation period will keep Master Kush's size under control inside, but she can get massive outdoors. Impressive eight-foot heights are common as long as the weather cooperates. Plants are usually ready to harvest at the beginning of October, but watch your forecast for heavy rains; mid-Autumn downpours could mean you'll need to cut early or cover your plants for a few days. Once switched to bloom, I found Master Kush needs 9 weeks minimum before she's ready to cut. If you like the stronger body buzz that comes with a higher percentage of amber trichomes, let them go another 3 days to a full week so they have time to fully mature. Plan to flush about a week to 10 days before you think you'll cut to clear out any excess nutrients and improve the flavour. The same density mentioned above can trap moisture deep inside the bud well after the surface and stems feel dry and brittle to the touch. Give the buds plenty of time to dry before you put them in curing jars or all your hard work could end up a mouldy mess that's dangerous to smoke. I continued to open the jars to let the buds breathe for a week or two longer than you would with a less dense strain. Master Kush needs at least four weeks of curing for the best quality, but the flowers are smokable as soon as they're dry if you can't wait to give this legendary smoke a test run and don't mind a bit of harshness. Thanks to the Skunk, Afghan and OG Kush genetic influences, Master Kush has a strong, penetrating aroma that's unmistakably pungent, but you'll also detect strong notes of fuel accented by fresh flowers and pine. 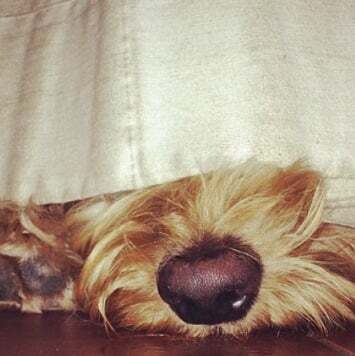 If discretion is a concern, don't skimp on odour control or your secret won't be a secret for very long; this strain is strong enough to leak through all but the best filtration systems. On the inhale, the smoke coats the mouth like heavy swath of silk. It's smooth to start followed by the bite of black pepper and exotic spices with lighter hints of tangy citrus and fresh soil running underneath. Master Kush's overall flavour is pleasantly intense but stops short of going too far, a refreshing change from some of the overly sweet strains in circulation today. As a 90% indica, Master Kush has a strong, but very calm, stone that relaxes the mind and the body. Mentally, you'll feel pleasantly light headed and perfectly calm with just the right amount of chill. Don't be surprised if you suddenly feel the urge to meditate or contemplate the meaning of life for several hours after imbibing this strain. The physical side is what makes Master Kush so popular with the medical marijuana community; she's heavily sedating with a long-lasting, numbing sensation that makes her a great choice for appetite stimulation, pain relief and insomnia. Master Kush by Humboldt Seeds is a solid strain for any grower looking for a reliable addition to their garden. As long as moisture is kept in check, she delivers a generous amount of high-quality buds, medical-grade smoke and extract-friendly resin levels. 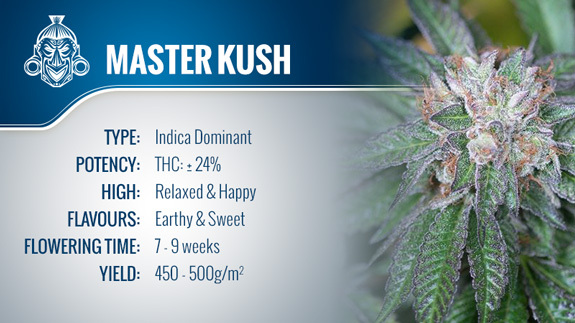 If you're looking for a heavy indica strain, Master Kush is worth checking out.